I’m slightly late with this one (the Mega Drive’s birthday was on the 29th October) but I realise that I’ve never written anything on this site about the console that was in many ways Sega’s greatest contribution to gaming outside of the arcade – and certainly the system that had the greatest transformative effect on my own view of games. There is an irritating tendency in retrospectives about the Mega Drive to focus on how it disrupted Nintendo, rather than examining what the machine (and its software library and ethos) achieved in its own right. Anyone reading these articles would think that the Mega Drive shot to success purely on the back of Sonic and Madden and then almost immediately went into decline as Nintendo’s ‘rightful’ mastery was reasserted (that is, if you narrowly regard the SNES’s library as the peak of 20th Century human achievement, as a worryingly large number of people seem to do). The familiar tale of how Sega managed to throw away the 16-bit crown through the proliferation of ill-concieved upgrades and peripherals makes for a gripping yarn (see Steve Kent’s book The First Quarter, which most retrospectives crib from heavily), but that all happened towards the very end of the Mega Drive’s commercial life. Before the wheels fell off the Sega Bus there was a period of at least five years when the MD was a significant force in the industry, playing host to a broad and frequently boldly innovative assortment of games. At the time of the Mega Drive’s launch, the gaming landscape was dramatically different to today. In Europe, home micros ruled the roost, with console gaming being the preserve of scattered importers and enthusiasts (a situation that would change as magazines like Mean Machines raised awareness of these ‘new’ platforms). Arcade games were seen as being almost a separate form, far beyond the technical capabilities of any home system to reproduce. In this climate, the prospect of a home console that could convincingly recreate arcade games was the Holy Grail. Before SNK took the literal approach with the Neo Geo, the Mega Drive was already making great strides toward this goal. In the years between the Mega Drive’s Japanese and European launches, the system developed a certain cachet. 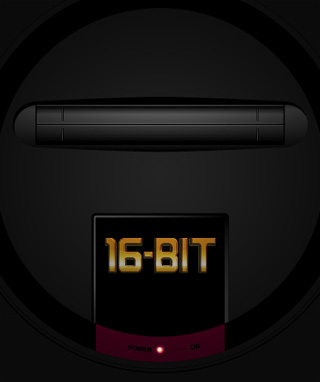 The sleek photogenic case design, the perfect cyberpunk-inspired moniker (really, has there ever been a more perfectly evocative and right name for a games machine than “Mega Drive”?) and the implied promise/threat to bring the dimly lit, seedy, unhealthy world of the arcade into the living room made the machine seem compelling and almost dangerous, and far removed from the family friendly image cultivated by Nintendo and Commodore. The Mega Drive was rock ‘n roll. A disproportionate amount of the early Japanese third party games for the system were scrolling shoot-’em-ups. This genre represented the most effective way to exploit the power of the hardware with the minimum risk and expense, as there was an abundance of arcade and home computer titles that could be quickly adapted. By the time Sonic arrived in 1991 and gave Sega a recognisable face in the mainstream media, the Mega Drive had built up a respectable first wave of original titles. Revenge of Shinobi, Toejam & Earl (for my money the best 16-bit game ever made), Streets of Rage and a run of Disney-licensed platform games (starting with Castle of Illusion) all offered experiences quite unlike anything available on the other home formats. While major Japanese third party support was thin on the ground in the early years (thanks to Nintendo’s exclusive partnerships and the Mega Drive’s weak performance in its home territory), console newcomers Electronic Arts stepped in and brought several wildly successful franchises to the Mega Drive, including Madden, PGA, NHL/EA Hockey, Road Rash and Desert Strike, as well as a raft of home computer ports of varying quality. The Mega Drive was the first console that wasn’t stigmatised as either a child’s toy or a pastime for tech-nerds. It was the first to be casually name-checked by celebrities and pop stars (outside of explicit promotional deals). Vic Reeves and Jonathan Ross owned them. Pop acts like the Manic Street Preachers and (erk) East 17 courted the youth demographic with features in Sega magazines (which in those pre-internet days were routinely drawing readerships in the hundred-thousands), and the machine became a regular fixture in dressing rooms and tour buses. While it couldn’t be claimed that the Mega Drive ever achieved mainstream media exposure on the scale later seen by the Playstation, it seems likely that the European-originated efforts to actively position the Playstation as a hip lifestyle accessory (licensed soundtracks, festival sponsorships, demo pods deployed in nightclubs, etc.) were heavily influenced by the Mega Drive’s nascent credibility. For all that, it took Sonic to turn the Mega Drive from an expensive toy that was abstractly more powerful than its predecessors into something that anybody could instinctively understand the appeal of, even if they’d never touched a controller. Again, the impact is harder to appreciate with the benefit of years of hindsight, so we must try to remember a time when we’d never seen Sonic (or the catalogue of indignities which Sega would later visit on their most excessively milked cash cow). Before Sonic, I guess a typical reference for speed in platform games was thinking that sprinting in Prince of Persia was jolly exciting, and Super Mario Bros 3 or perhaps Shadow of the Beast would be the benchmark for environmental detail, not that anyone would be using the term “environmental detail” for a good few years. I can remember seeing the first (black and white) screenshots of Sonic in Sega Power, and imagining perhaps a moderately slicker version of Rainbow Islands or Flicky. Seeing the game running for the first time was a revelation. Sonic (the game) wasn’t just a vehicle for an iconic mascot, it was a motivational force, a hypnotic form of sensory overload that shifted countless units and inspired a million playground oaths of allegiance. Sonic had the effect of raising the bar for the technical quality of Mega Drive games, and the newly expanded userbase that the machine netted over Christmas in 1991 justified publishers making the investment to try to match that level of quality. As a result, 1992 saw a new wave of more ambitious and polished titles with the massively enhanced Streets of Rage 2 and Sonic 2 (at the time, probably the most hyped gaming ‘event’ yet seen) showing that Sega weren’t content to rest on their laurels. Sega also continued to try to offer games outside of their traditional arcade/action specialisation, bolstering their slightly anemic lineup of RPG titles with Climax’s isometric adventure Landstalker, which garnered a brief but fervent pre-release buzz heralding it as the Mega Drive’s answer to Zelda, as well as being the first game to ship on a 16 megabit cartridge. While the arrival of Street Fighter II on the SNES stole some of the Mega Drive’s thunder, it wasn’t until Christmas 1992 that the SNES was adopted in significant numbers in the UK – so even though the Mega Drive was pushed to greater heights in subsequent years, from 1993 onwards the limelight was shared with Nintendo’s machine. 1993 is the point at which it becomes difficult to compile a shortlist of exceptional releases. High quality games were coming thick and fast, repeatedly defying preconceptions of the machine’s capabilities. Gunstar Heroes announced Treasure’s arrival as an elite developer. (Contrary to some reports, the game was not entirely overlooked at launch, but it was never marketed by Sega or pushed by magazines as being an important release in the same way as Sonic or the other big name franchises of the time.) Ecco the Dolphin proved to be innovative and aesthetically pleasing enough to stand out from the rapidly growing crowd of character-based platform games that followed in Sonic’s wake. Street Fighter II (Special Championship Edition) also arrived on the MD that year, as well as Mortal Kombat (probably the most important release of the year from a commercial standpoint, going on to outsell the SNES version by a large margin) and Sega’s homegrown entry into the genre, Eternal Champions. Konami released their first wave of MD games (including the excellent Tiny Toon Adventures), although it would be another year before their big name franchises (Castlevania and Contra) graced the system. Several other third parties had struck on repeatable formulas by this stage: Dave Perry and Shiny cranked out rotoscoped platform games, Probe developed seemingly endless arcade ports and movie-licensed platform shooters and Codemasters had the ever-reliable Micro Machines. Sega had no Sonic game ready for Christmas ’93, but the MD still saw the release of the original FIFA, and the long-awaited Toejam & Earl II, which boasted incredibly lavish production values but somewhat disappointing gameplay as a result of deviating from the first game’s design in favour of a (supposedly) more easily marketable platforming paradigm. Thanks to the extremely high prices of cartridge games (ones with larger capacity and/or battery backed memory often carrying a price tag of £59.99 or more), the sheer volume of releases, and the relative inconvenience of piracy, it’s probably safe to say that most Mega Drive owners missed out on a few games during the machine’s active life. The game that I most regret not playing until years later via emulation was Shining Force, a game which I consider a prime example of what developers were able to achieve thanks to the ‘perfect storm’ of favourable conditions that the Mega Drive offered: a large user base, long shelf life, powerful and well-understood hardware, small teams and short development cycles. These conditions encouraged technical innovation and allowed publishers to take risks on more experimental ideas. If a game was a hit, two or three sequels could be squeezed out before the machine was put out to pasture, and if a game flopped this might only represent a setback for the developers rather than a terminal disaster. From 1994 onwards the law of diminishing returns started to take hold. While there were still quite a few releases that pushed the envelope (Comix Zone, Alien Soldier, Cool Spot 2, Toy Story), and many franchises saw incrementally improved third or fourth installments, the critical and commercial response was no longer guaranteed to be enthusiastic. Beyond 1996 the only significant releases were those that had suffered delays for one reason or another. Although Sega killed the Mega Drive and its sister platforms prematurely in an attempt to shift focus to the Saturn, even if this hadn’t happened, the Mega Drive’s glory days were over by this point and the remainder of its life would probably have resembled the later years of the Playstation 1 and 2, budget systems with games aimed at younger siblings who had received the machines as hand-me-downs. Looking back at the period in the early 1990s when the Mega Drive and the SNES shared the games market between them, I think that some of the rules that shaped this outcome are just as applicable today. The reason that neither machine was able to completely unseat the other was that each was designed with a different set of priorities in mind. The Mega Drive, with it’s faster CPU and ability to throw more sprites around was a better host platform for shoot-’em-ups, scrolling beat-’em-ups and visually busy platform games. The SNES’s better sound and larger colour palette (including alpha channel effects) made it the preferred system for RPGs. For modern consoles, the divisions are not quite as clear cut, but it is still evident that games are too broad a medium to be adequately served by a single, unified, ‘DVD player’-like platform. Technical specifications have implications on what type of games will work, and even the choice of default controller peripheral has an effect. The nearest anyone has come to covering all the bases with a single system was probably the original Playstation, and even then frustrated developers looked to the PC and Dreamcast to overcome the machine’s shortcomings, and certain genres and styles of games which the Playstation struggled with disappeared from the shelves for years, only to be revived on later systems. Something else that the rise of the Mega Drive (at the expense of the NES) and it’s ultimate downfall (along with the SNES) at the hands of Sony clearly illustrates is that brand loyalty counts for nothing in the world of console hardware. If another platform arrives on the scene and can offer a compelling software ecosystem (rarely a single ‘killer app’, although Sonic on the Mega Drive and Street Fighter II on the SNES fulfilled this role to an extent) coupled with a suitable price point, a large chunk of your ‘loyal’ (meaning ‘captive’) user base may switch allegience overnight. For instance, a $199 Playstation 3 bundled with one impossible-to-ignore exclusive title (while something that’s unlikely to materialise any time soon) would torpedo the Xbox 360’s growth curve. The Wii’s burgeoning user base might drift elsewhere if Nintendo became too complacent about keeping the release lineup fresh, and somebody (anybody) was able to pitch a viable alternative to that audience. Or another company (Google, Valve, Apple) might introduce a product that upsets the market in another, unpredictable way. But these lessons are not as interesting, vital or relevant as the ones that can be taken from playing the games themselves. Nearly all the titles I’ve mentioned above are available in some legal, convenient form if you have a PC, Mac or modern console or handheld of some sort. I strongly encourage checking them out, taking advantage of the added convenience of multiple save states and built-in action replay codes where the difficulty level becomes a barrier to your enjoyment. Many of these games have aged well and are just as enjoyable as they ever were (particularly in a multiplayer setting). Some simply haven’t been directly superceded (in the same way that Elite hasn’t). Which games of today will withstand the ravages of time, and what innovations will emerge in the next twenty years that surpass and confound our expectations? Whatever experiences games have in store for us in the coming decades, I’d like to think that they will be that bit richer thanks to the Mega Drive (along with other great, creatively fertile systems like the SNES and Amiga) helping developers and players to understand the true potential of the medium.